When the Breckenridge Distillery opened its doors in 2008, no one realized how a passion for food, booze and the outdoors would transform this small operation into a world-renowned distillery. Today, Breckenridge Distillery turns out award-winning bourbon, vodka, rum and so much more. It’s also home to a spirited restaurant that serves as a gathering place for locals and visitors. Adventure is calling in Breckenridge. Here are the distillery’s favorite ways to answer. Snowboarding is winter bliss, so it’s no surprise that these two make the perfect pairing. Head out on the mountain with friends – we suggest Peak 6 – and then head back to the Breckenridge Distillery. 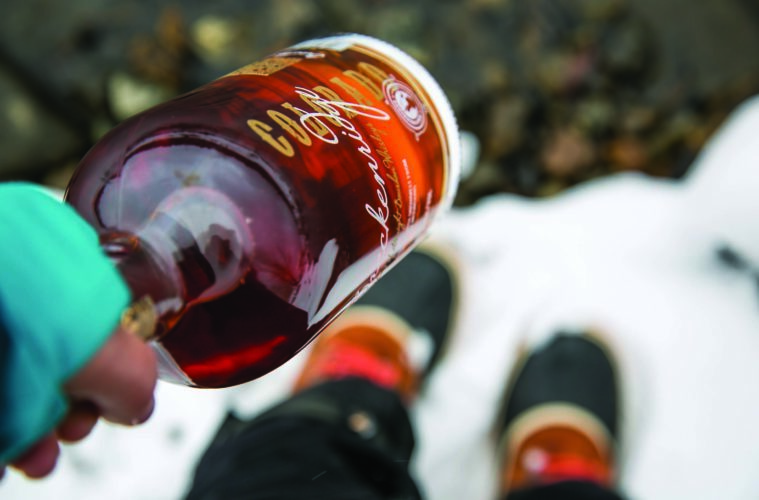 This tap cocktail features Breckenridge Spiced Rum with a house mix of winter spices and ginger. A classic cocktail for a classic sport – both date to the mid-1800s yet never wane on style. Whether you mix your martinis at home or après in your best wool ski sweater, the toughest decision will be Breckenridge Gin or Vodka. Sped up or taken slow, cross-country skiing is the perfect warmup on a cold winter day. When you’re all done enjoying the views, you’ll crave a refreshing treat. The Genever Juice satisfies. It’s a gin cocktail with hints of rosemary and lemon, and it’s only available at the Breckenridge Distillery. Whether you’re looking to rest your ski legs, or simply enjoy some solitude, winter fly fishing is a great way to uncover the quieter side of Breckenridge. And no matter how many layers you pile on, it always feels good to warm up with a classic hot toddy. Simply mix Breckenridge Bourbon with hot water, lemon and a touch of honey. BRAAAP! After a day powering through powder, it’s time to indulge with friends. We suggest a family-style round of Oaked & Smoked cocktails at the Breckenridge Distillery. It’s a Colorado spin on classic punch flavors and includes the perfectly-balanced combo of Breckenridge Bourbon, Breckenridge Spiced Whiskey, in-house allspice dram, tea and citrus. There’s a reason bicycle flask mounts are a thing. Consider it a cup holder, made for your bike and designed to hold your flask. Fill it with Breckenridge Bourbon and you’re ready for a fat bike adventure. Don’t forget your helmet. We’re all kids at heart. But let’s face it, we’re glad to be adults – because there’s no better way to top off a classic winter day than with Smoking Cocoa. Start your afternoon with a few trips down the Carter Park Sledding Hill. Just when you think your grin can’t get any bigger, order this mix of Chili Chile Vodka, Espresso Vodka, and hot cocoa, all topped with espresso whipped cream and Nutella. through the woods. The views you’ll discover here – of mining history, mountain ranges, and skies so blue they seem surreal – are anything but ordinary. That’s why the end of a snowshoe trip calls for Espresso Vodka and coffee. It’s a straightforward mix anyone can blend at home. And the flavors are exceptional. Big days calls for bold flavors. Whether you’re peak-bagging or celebrating a picture-perfect view, a flask of Breckenridge Darks Arts is the perfect toast to adventure. Ski or splitboard, you choose. But keep that flask close to the vest – this treat is best served neat. Trust us, it’s worth the extra weight. Visit BreckenridgeDistillery.com for recipes, restaurant hours and tours.